Riding down to Sausalito Wednesday evening. I’m engineering for a class and managed to get my messed up lighting issues solved so that the nighttime return trip won’t be too treacherous. In fact, I’m pretty pleased to be getting in some cheap miles and spend time with good friends and a talented instructor. I just miss the light to jump across from the bike path to Bridgeway, so I head forward on the less used section of wide path/sidewalk, planning to use the next opportunity to cross. About two or three pedal strokes to regain some speed - BAM! 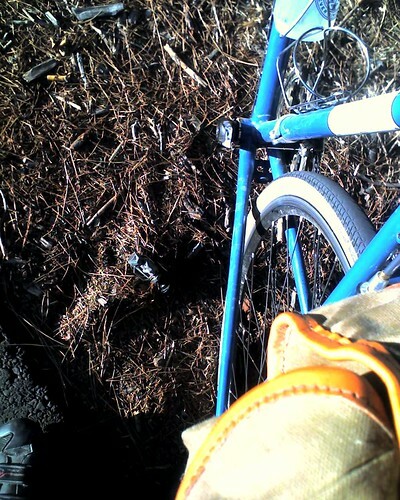 - the whole bike shudders and my left foot is unclipped. I’m still upright and moving forward, but finding only air. 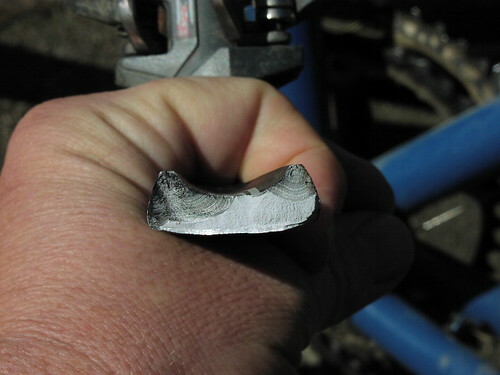 It seems that I had some catastrophic pedal failure, and I look down to see, well… pretty much nuthin’…. which is kind of a further surprise. There’s about three inches or so of crank arm left, and a slightly jagged looking silver face. I slow down, realize that I’m pretty W&TF and look back to see if there are any parts in my wake. At first it seems like everything had just vanished. Backtracking further, I see the Time pedal and it’s rather forlorn and useless appendage. You’ll have to excuse the cruddy little phone cam shot. There are some clearer photos to follow. The immediate issue was arriving early enough to change into street clothes for the class. I still had about 3 miles to go, and I wasn’t really going to be moving at precisely the same speed I’d enjoyed. A quick call to let them know and I saddled up and started kicking it one-footedly down Bridgeway. It wasn’t any particular hardship, really. I mean, if you know the parallel option, it’s not particularly hilly - in fact, it could be described as just about dead-flat. 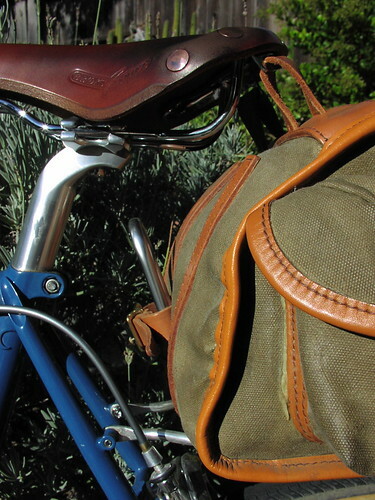 A little playing around with gear choice, and the only downside was the rather, um, different means by which you contact the saddle when pedaling one-legged. Not trying to get graphic, just trying to make the case that you want to be a little careful when engaging in that method of transportation. The bit on the bike. Looks like things propagated from the leading edge, which seems to be the darkest area. 107 is the new length. All the kids’ll be riding ‘em soon. You heard it here first. As I was snapping these photos (all of which are over in a Flickr set, as you’d expect), it struck me that I needed to deal with this whole thing. (Hey, it was early, I was on my first cup of coffee and had to get to work.) 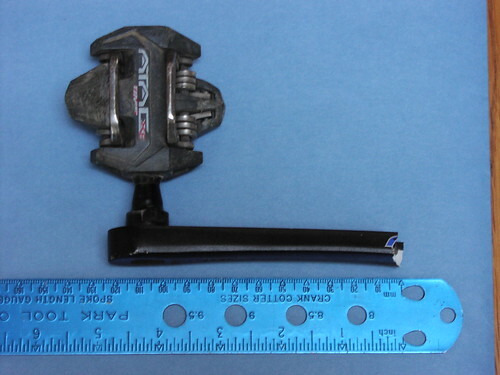 Since I’d had some issues with the ISIS connective spline, this pair had come directly from Ritchey on a warranty. I wasn’t sure what the warranty period was, but thought it would be at least worth asking. Emailed them through their website, and got an autoresponder that said they were out at Interbike this week. Ok. Fine. I headed into work with the vague idea of swapping the stock Sugino XD’s back on, and switching chainrings to maintain the same gearing. 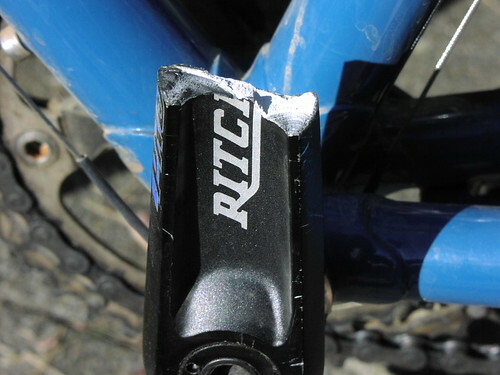 By the time I got back this afternoon, another email had come through from Ritchey USA. This time, they attached a helpful little pdf which documented a voluntary recall they had instituted, as some of the early cranks were busting on the non-drive side. I looked up the date codes on my nubbins, and curiously enough, it did seem to fit within the date of the recall. So, as soon as they send me the actual RA#, I’ll be sending this down to them. It did keep me thinking. In my only other crank fracture, I was out of balance and on the ground pretty danged fast. Since the bike and I were climbing at the time, and it was a fixed-gear system, torque was pretty high, though thankfully the speed remained low. This time around, things were on the flat, and I had a decent amount of momentum going. When the arm failed, I do remember coming down very hard on the right pedal. Luckily, I had my weight pretty well distributed. But, I think it also strongly attests to the stability of the Rivendell A. Homer Hilsen. Things went from pretty normal to very out of balance in a big hurry, but the last thing I even worried about was how to stay upright on the bike.